The amazing but aloof Doctor Black Jack is back in this second collection of adventures, ready to perform amazing medical feats and show up the establishment doctors who care more about money or fame than their own patients. Along with his sidekick Pinoko (made from a cystoma in a story from the previous volume), Tezuka's protagonist once again pretends to be an uncaring jerk while all the time trying to save the lives of those who need him. In this volume, again made up of a series of roughly twenty page adventures, he fights a needle in a human body haystack, saves a killer whale, and even out-performs a speed surgeon to save another girl's life. This time, however, we also get a little shifting action types, as Black Jack must use his skills to outwit the police, save himself from a sealed room, and even stave of death in two very raw environments. Now that we know who Black Jack is, the collection editors allow him to roam more in this trade. I like when characters are taken out of their comfort zone, so those stories were some of my favorites this time around. We also get to see more of the Black Jack-Pinoko interplay. Pinoko looks to be a small child and talks accordingly, with Tezuka slurring her speech for comic effect. However, he thinks she is a full grown adult, and often calls herself Black Jack's wife, much to the discomfort of everyone involved. I'm curious to see how her story plays out in future trades. As in the first volume, Black Jack is seen to the world as an arrogant extortionist who only works for the highest bidder. But the reader knows the truth and often those who criticize Black Jack the most are also those who have the worst moral standing. There's not a lot of character development for Black Jack himself, though we do see his arrogance take another set of hits as he learns first hand that he's not always perfect. Most of this volume is spent showing how Black Jack works the system to his (and often, a helpless patient's) advantage. We even meet a person more altruistic than Black Jack himself, who isn't afraid to show it. Black Jack's reaction, both to his alternative medicine and refusal to hide his good deeds, are an interesting quirk I'd like to see again. Since there are a lot of volumes, I'm not worried about BlackJack evolving every time. However, since these stories are presented out of order I'm guessing that there's more to Tezuka's character and we'll see it over time. I spent a lot of time talking about the art style in volume one, so I'm not going to repeat myself here. The artwork is common to that of the early days of manga, with characters drawn for effect rather than realism. People are short and squat, tall and thin, have huge beards, eyes, or eyebrows as the case may be. Only Black Jack himself is drawn mostly straightforward. As I said last time, it's a bit like reading the stills from an old hand-animated cartoon from the 1940s. This does not mean that there is a lack of skill in the pages. Tezuka's panels are filled with action and drama, along with just a bit of humor to keep the stories from becoming too serious. The pacing is just right, with each story feeling complete despite only running through less than two dozen pages. There's a lot of action expressed by movement--people are shown at angles, for instance, rather than straight on. We get a fair amount of gesturing, close-up shots, and even a bit of the action lines so popular in the modern shonen manga I've read. As a student of classic comics, I'm captivated by how well Tezuka presents his stories despite not having the sophisticated art styles I read so often in comics now. Like Kirby or Ditko, Tezuka is taking the genre and making it something bigger than it was when he found it. Watching that play out across the pages is a real treat. 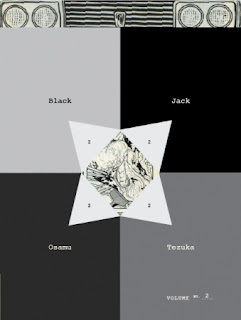 Black Jack is a timeless series that only shows its age on the surface. Once you start reading, you'll be hooked, especially if you are a fan of medical shows like House or ER. I regret not starting on Tezuka's works earlier, but now that I am reading them, I'm a huge fan. If you haven't sampled his works yet, I urge you to give them a try!